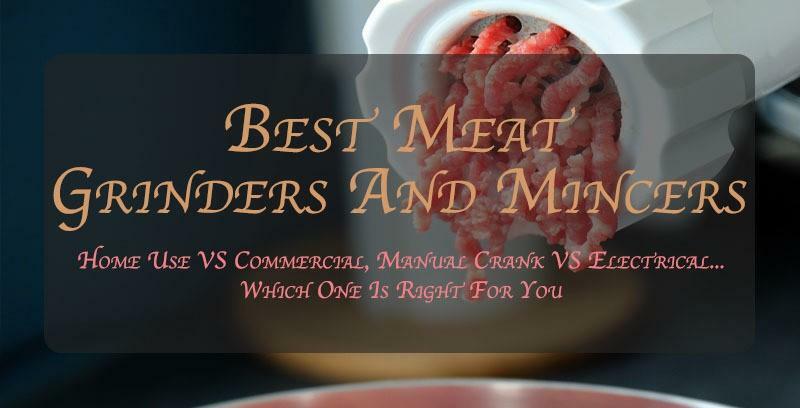 2 Manual, Electric or Commercial Meat GrinderWhich Is The Best One To Choose? Why would I want to grind my own meat? This is the question we’ve often heard from people to whom we recommended to buy a proper meat grinder for their kitchen, and stop buying ground meat from the store. You see, there are a lot of advantages of doing this at your own home – not only you can grind the meat as thick or as thin as you want, but you can also lower down your grocery bills, reduce the consumption of some pretty dangerous additives, and create the dishes that you wouldn’t be able to prepare with the store-bought meats. You can even create raw but healthier food for your pets! There are thousands of meat grinders on the market right now, and it’s no wonder why so many people give up on choosing and buying one of these things. Have no worries – that’s why we’re here! We’ve decided to take the most popular of these devices and review them in a proper and unbiased way, giving you a comprehensive list of the best ones that one can buy today. We’re going to take a detailed look at their features, design, and performance – this is the buying guide that you were looking for! Let's take a look at the different type of grinders there are on the market and which one should you choose. 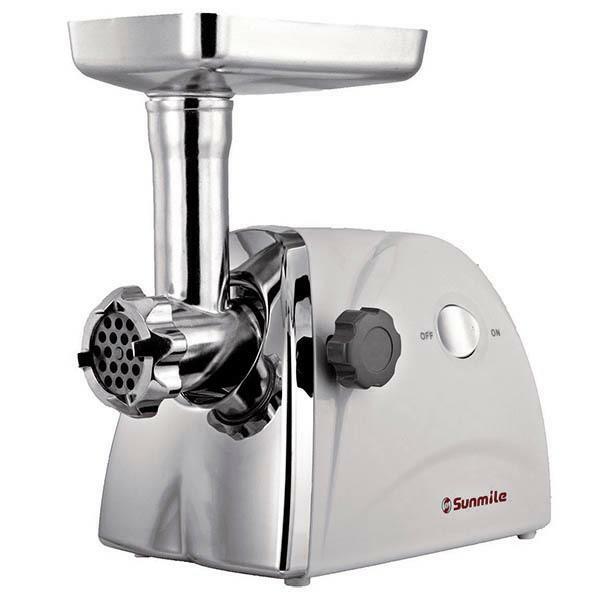 As the name suggests, this is the most basic kind of grinder you can buy – operated manually by turning the crank that can be found on the back side them and mincing meat at the speed you can crank it. You’ll have to put some elbow grease into the process here – these devices depend solely on your strength and patience, and we certainly don’t recommend them to people who aren’t physically fit to put some effort to the crank. The whole process can be extremely tiresome if you’re grinding a lot of meat at once. That is why these manual grinders are the perfect choice for people who will use them only occasionally, as well as for people who are doing a lot of camping since they can be used in areas without a reliable source of electricity. Another great feature is the fact that they rarely break, and many folks will choose them just for their dependability and durability. Unlike the manual mincers, electric grinders require only two things from you – to start them up with a press of the button and to feed their tubes with meat. They’re often equipped with two or three cutting plates of different sizes, wider feed plates than the ones that can be found on the manual ones, and require almost no effort in the whole process of grinding. This is the reason why they are perfect for people who mince meat on a regular basis, as they produce higher amounts of food with the smallest amount of required effort. They are, of course, much more expensive than the standard mincers, and also sport some features that can’t be found on the manuals – like the REV button that help meat break down into the chunks of raw meat. They also have much more options in terms of tubes, plates, and other extra accessories. 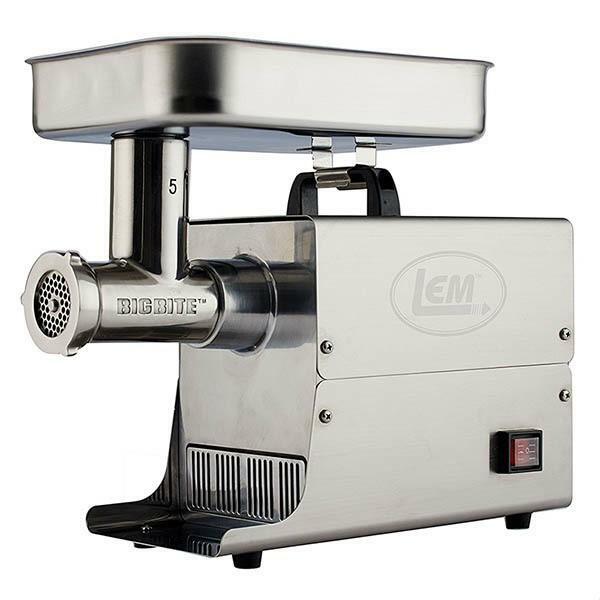 If you’re an owner of some kind of cafe or eatery and need large amounts of meat mince every day, look no further – a commercial meat grinder is a perfect choice for you. Used by professional cookers and chefs, these kinds of mincers are often employed in shops and the kitchens of the restaurants, or at any other places where there is a high demand for ground meat. They can easily handle massive amounts of meat, since they have powerful electric motors and huge blades and plates, as well as some additional features like the ability to grind big, frozen blocks of meat. They are, of course, a lot more expensive than machines that are intended for home use– you’ll have to dig a bit deeper into your pocket if you want to purchase a commercial machine that can mince large amounts of meat. Manufactured by LEM Products, the 17771 Big Bite is something definitely worth checking out and a worthy competitor for the title “best meat grinder of 2019“, especially if you’re on the market for a commercial stainless steel grinder for both home and business use. It is a bit of a pricey machine but I do think that it is worth every penny you pay for it. The Lem’s performance and features are amongst the best on the market. Let’s have a look at it! 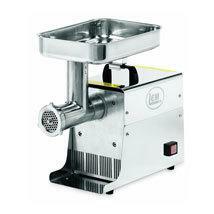 When it comes to design, the LEM Big Bite looks like a pretty standard stainless steel meat mincer. It is entirely made of steel and stainless steel cutting blades, and the first thing you might notice about it is its definitely large meat pan and the auger that pulls the meat down into the tube. LEM Products claims that the grinder can mince over 240 pounds of beef in an hour. This is very handy if you’re a restaurant owner or you run a busy burger place. Now, that amount might be a bit of an overstep for a home user, but in case you’re a hunter an catch a deer, you’ll have a piece of mind that the LEM grinder will mince that mean in no time. The .35 HP motor is, fortunately, permanently lubricated and surely won’t break for a long time, which is exactly why the LEM is giving a 5-year warranty for the product. The unit is absolutely ideal for making sausages at your own home, as it has three grinding plates and stuffing tubes that make the whole process a breeze to do. We were pleased to see some accessories inside the box – like the stainless steel knife and a meat stomper. Overall, the LEM grinder is a sturdy machine built with performance and reliability in mind. Mincing meat at scale is fast and easy to do – something to surely satisfy both home and commercial users alike. It comes with a very powerful and durable motor, strong blades with sharp edges, and stainless steel to make it nice and easy to clean. The LEM mincer is one of the quietest grinders on this review list – something amazing considering the power that the motor delivers to the blades and the speed it does it at. If you can afford the steep price, the LEM is definitely one of the best meat grinders money can buy today. 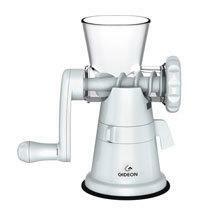 The second mincer we’re going to take a look at is made by Gideon. It is a bit of a old school one, a hand cranked model that is grinding meat well with steel cutting plates and it is dishwasher safe for the most part too. 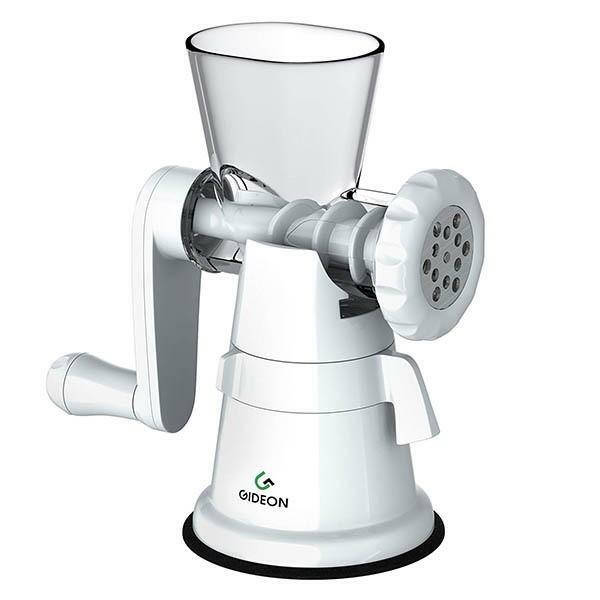 The first thing you might notice about Gideon Hand Crank manual grinder is the simple, yet effective design – the device comes in white color and looks very simple but functional. Its weight is only 2.5 LB, while the exact dimensions measure at 10.9” x 6.7” x 6.1”. The whole mincer is made of decent quality heavy-duty plastic combined with steel and looks pretty durable overall. While the whole mincer is made of plastic, the grinding plates and the end screens are made of high-quality stainless steel. The accessories that come with the Gideon are not much, but enough to satisfy the needs of most small to medium households. In the box you'll find two grinding plates – one fine and one coarse - plenty for most small families needs. The Gideon is pretty easy to take apart. You can clean it with your hands or put it in the dishwasher - it is perfectly safe to wash it there. . It’s ideal for grinding burgers – there’s absolutely no leakage involved in the process, although we didn’t really like that the fatter cuts of meat make pushing the crank really hard. The blades of the grinder are, of course, fully enclosed which eliminates the chances of injury. 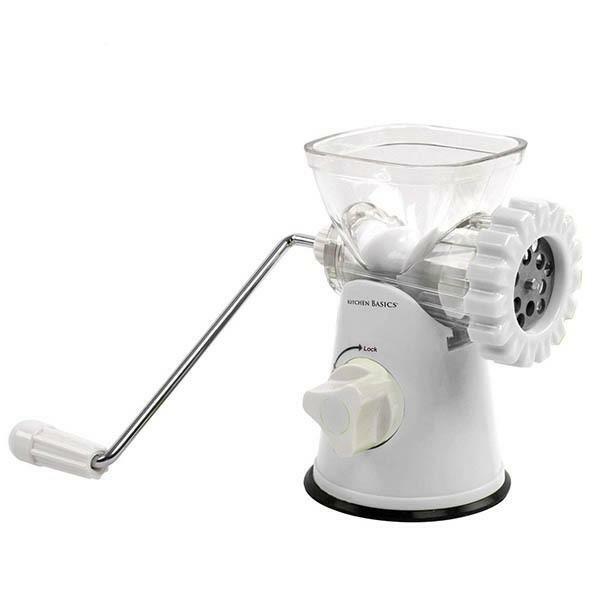 It is great for sausage stuffing but you can't expect to process a lot of meat per hour with a manual mincer. The stuffing plate works great regardless of that. Overall, the Gideon hand cranked grinder is a decent, unpretentious choice for the budget minded household. It works for the most port, but keep in mind that is made mostly of plastic, including the meat delivery system that pushes the mince through the blades. The price, of course, reflects that, but don't expect miracles from it. It is nowhere near the class of the Lem above. This is where we come to one of the cheapest meat grinders on the market – the Kitchen Basics 3-In-1. Even though this unit is pretty affordable, it is still very much functional and definitely worth considering if you’re buying a mincer. This is truly a champion when it comes to weight – weighing only 2,1 pounds, it’s a perfect choice for all those who are looking for a lightweight option to grind meat at home. The reverse function is manual but you can's expect different in a manual grinder. It is made of ultra-durable plastic and is equipped with some pretty sharp stainless steel Japanese blades. Like many other kitchen appliances made by the company, it comes in elegant white color, that will certainly fit inside most kitchens. There is no kubbe attachment but you can't really expect one for the price wanted. This handy and efficient tool is ideal for mincing meat, garlic, beans, and all kind of vegetables. Also, it is quite easy to use thanks to its somewhat ergonomic handle. The suction cup works well, even though we’ve had some problems with it in the beginning See, just like the Gideon above, you have to have a perfectly flat table made of plastic, glass or metal. The manual grinder counts on a suction cup to stay mounted and, as we all know, suction cups don't really work unless they are attached to mirror-like surfaces. Keep that in mind if you have a rustic wooden table or counters of the sort - those suction cup mincers can't be securely mounted to one of those. I was somewhat pleased to find some of the accessories in the box – the sausage stuffer and the pasta maker. The former will allow you turn the meat into delicious homemade sausages, while the latter helps the user to make two types of pasta – spaghetti and rigatoni. There is no reverse function other than manually turning the crank the other way around. Overall, the it is an affordable, simple grinder that doesn’t take too much space, it won't trip the circuit breaker upon use, but still minces meat and products at a somewhat acceptable level. Keep in mind that it is VERY budget oriented and if you're after something that is more upscale and nice, might be better to keep looking, especially if you have pounds of meat to ground. 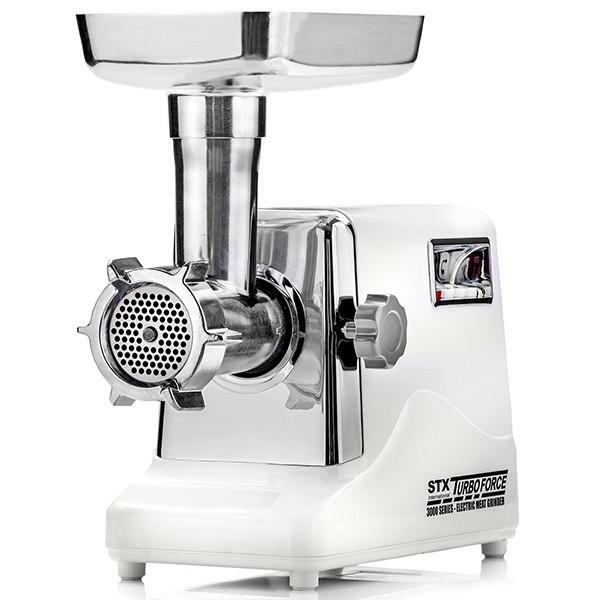 The STX Turbo Force 3 Electric meat grinder is a solid choice for big households and small commercial ventures. While not as mighty and powerful as the LEM 17771 at pole position, the STX does the job well, it costs less and overall it is a great electric grinder to have. It is amongst the most popular models sold on Amazon and there is a very good reason for that too. The STX Turbo Force features a solid and powerful build, unlike the finicky manual devices above. Everything is shiny stainless steal with some plastic accents that doesn't look cheap at all, especially compared with the Gideon above. You can easily grind pounds of meat before it trips the circuit breaker, if it ever does. The STX 3 has a three speed, 3000W electric motor with plenty of torque and power. Again, not in the range of the LEM above, but pretty close, especially considering the price difference between the two. The STX, however, has an effective cooling system that prevents the electric motor from overheating, effectively prolonging its lifespan and durability. The grinder head blades and the push plates are mode of solid steel and are very easy to take out and clean. The plate is also made of steel and it is a bit bigger than most mincers on this list. The list of accessories included is nice, especially considering the sausage attachments and the tomato juicer. The grinder head is dishwasher safe for the most part except for the cutting plates. Overall, the STX Turbo Force 3 electric mincer is a solid choice for those that want a proper, commercial grade electric grinder for a very good price. Actually, the STX was edged in our test by the LEM by a very little, especially when you consider the price as a factor. The LEM is the better grinder for sure, but is twice as good as the STX? Well, I don't really think so. I'll leave the choice completely up to you. Much more affordable than the STX’s model, the Sunmile SM-G31 ETL Electric Grinder comes with some neat features and somewhat questionable performance. 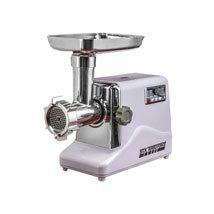 It is a decent choice for you if you're after a very small & lightweight meat grinder for you kitchen. Both the blades and the plates of the Sunmile are made of stainless steel, while the grinding head features die-cast aluminum build. To make the meat reach these blades and plates, one has to use the meat tray – square-shaped and made of aluminum it can also be detached at any time. The Sunmile's 250-watt motor works well for the most part, although it can’t really be compared to the STX and the LEM machines above. It is just nowhere near the class and the power of any of them two. It is OK at best for general use, but you might experience the whining sound of dead if you try any meat that is tougher that chicken, to be honest. While it does look good on paper, we had some issues with stuffing sausages with the Sunmile. It lacks a proper attachment for it and it is very cumbersome and tiring to do without one. Overall, I can't really recommend the Sunmile for anything more than occasional use for softer, maybe even already cooked or processed meat. It just lacks the power to properly grind and mince meat to anything of acceptable quantity and quality. It is decent enough for very budget oriented households, but it didn't offer any sort of excitement during the time it spent in my kitchen, especially compared to both the LEM and STX. Both are MUCH better products if you can live with the price tag. The first thing to determine is the size of the meat mincer that you’ll need. The most common sizes of the grinders for home use are 5, 8, 12, 22, and 32 oz. As you might have guessed, a smaller unit comes with a smaller feeding tube and smaller cutting plates, and the larger comes with a bigger tube and bigger grinding plates. If you’re always entertaining lots of friends or making big batches of sausages a few times a week, definitely go for a larger one with bigger grinding plates, especially if you're mincing more than a few pounds of meat at a time. If you’re only occasionally making some meatballs or burgers, you can safely opt for a smaller machine . Another important point to consider would be the frequency of use, which is very similar to what we talked at the previous point. Do you plan to use the mincer frequently or once every few months? If your answer is the latter one, you should definitely buy an inexpensive model, and we would recommend one of those with a hand crank. Of course, if you don’t want to grind the meat manually, you can go for an electric model – in that case, we advise you to go for bigger models, like the STX and especially the LEM, if you can afford it, of course. You should consider the type of minced meat you'll be grinding more often and what it will be used for. For example, if you're only grinding the occasional steak or pork chop for some delicious burger on the fly, you don't really need a big and bulky, expensive meat grinder. Opt for a manual one and I'm sure you'll be happy with the for years to come. On the other hand, if you're looking to regularly grind raw pet food, for example, you will need something that is durable and a bit heavy duty too, like the Lem or the STX Turbo Force. They can both mince chicken with the bones for example, and the Lem can even grind frozen meat with a surprising ease. But be careful - if something seems too good to be true - it usually is, as always the case. Be careful with some of the cheapest mincers - most of them are finicky devices made in China and the likes and rarely last more than an year or more. On the other hand, invest a bit more in a proper grinder like the Lem and the STX and you'll have a faithful servant for years to come. It is a matter of priorities and I can't really tell you which one to buy, but keep in mind the written above and make an educated choice. As you might be guessing already, I totally fell in love with the LEM Products one. No question about it - it is a true commercial grinder dressed in home clothing and nice steel cutting blades . Well, not really, it is quite big and bulky, the the sheer power and performance you get from it is simply stunning. If you can afford the LEM, have space for it and you can justify the price of owning it while putting it to good use, I think it is without competition in its field. Yes, the STX Turbo Force 3 is ALMOST as good, but not quite. Nowhere near in my opinion, but other might argue so I'll leave it as that. Truly the best meat grinder I've ever laid my hands on. It grinds, minces, chops and stuffs sausages with the confidence and ease of a commercial machine at the comfort of your own home. Highly Recommended!!! The Gideon Manual Crank mincer is not too bad either if you can overcome the shortfalls of the model's grinding plates. You will need perfectly flat mirror-like surface if you want to achieve remotely stable grip to the table or counter you're trying to mount it on. It is a decent grinder for occasional use and small mincing portions. You can't grind anything of quantity unless you're Popeye the Sailor and have some spinach laying around. The rest of them I'm not going to even mention here. OK-ish but nothing fancy and after all, this article is about the best of the best meat grinder you can but, it is not about mediocrity and average products. Really hope this article helped you in any way with your choice! Please do let me know if you spot the occasional typo, have a question or concern about any of the products above or if you just want to say hi and "good job on the blog". Looking forward to hearing from you!